Kids Pointe will be having their Semiannual sale of Britax carseats starting Wednesday, April 29th! Remember they price match, so you can save money by not having to pay for shipping. Price matches are only for items with the same style/pattern. This sale ends Saturday, May 9. Local Readers – Be Green With Your Clothes! Have you tried consignment stores for your clothes or your kids clothes? Local readers have a great resource in our town call Kids/Fashion/Furniture Pointe. This is a store where you can “recycle” your family’s clothes but at the same time buy a whole new product like furniture (which is the case for our local store.) From this store, I have gotten many personal things for our family – from maternity clothes to baby clothes. Some of the baby clothes I have come home with include Gap, Carters, Children’s Place, and even a couple of smocked dresses! How can you utilize stores like Fashion Pointe? 1) Sell your or your children’s clothes – Kids/Fashion pointe pays cash! 2) Bring in a price comparison – Kids/Fashion pointe matches! Receive a FREE sample preschool pack Here. If you missed it last time, you know NOT to wait. 150 kids songs for only $.99 at Amazon. Get it by clicking the link below. Babies R Us Coupon – $5/$25 Here. 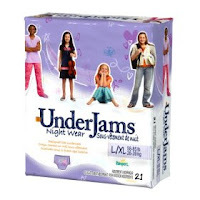 Get a FREE Underjams sample Here. Get 150 Fun Songs for Kids for $.99! Indiviudally, these songs would cost $132 – what a savings! Click the pictures below for the link. I am excited about this post. These are two great websites for listening to children’s books. 1) Storyline Online: This website is sorta like reading rainbow. It includes some great books read by famous actors and actresses. Two great books include Stellaluna and The Polar Express. 2) ThumbleBooks: I think I prefer this website more. You need to navigate your way through this website. Go to the Tumblebooks Button, then to the Storybooks button. From there enjoy over 100 wonderful books. The animation even highlights the words that are being read so new readers can follow along. Try Olive the Other Reindeer for the Chirstmas season. Trust me, this is an adorable Christmas book. For older readers you can choose Tumblereadablesa (instead of the Storybooks button) and have access to classics such as Anne of Green Gables, Black Beauty, and The Gift of the Magi. There are also online quizzes, wordsearches, and matching games for the books. Coming from a teacher, these websites are GREAT! I really encourage you to use these resources. What a frugal way to bring education and fun to your home!